BERKSHIRE finished third in Division 1 of the ECB Women’s County Championship – their highest ever placing since the new format was introduced. This is a tremendous performance as the only non first-class county in the top league. What makes it an even more creditable effort is that Berkshire played only five matches, winning three of them and losing the other two. They had three fixtures cancelled due to rain – more than any county in the top division. The season got off to a thrilling start with a one-run victory over Nottinghamshire, who were bowled out for 140 in reply to the visitors’ 141. The next two fixtures, at home to Sussex and Surrey on successive days at Wokingham CC, were cancelled due to the unseasonal wet weather. Berkshire then suffered two defeats. Their total of 193 (Isa Guha 58no) was overtaken by Essex for the loss of six wickets. Then, Berkshire were dismissed for 207 (Lissy McLeod 76) as they replied to Yorkshire’s 253-9 (Lauren Winfield 126). But skipper Heather Knight’s side bounced back to beat Middlesex (173) by five wickets. The eagerly-awaited match with Kent, who were well on their way to winning the title, became Berkshire’s third casualty with no play possible at Canterbury. Berkshire went into their final match against Warwickshire at Sadlers End knowing that a win would put them in a very strong for a third place finish. And the team rose to the occasion, winning by 76 runs. Heather Knight stole the honours, with both bat and ball. The England star hit 101 out of her side’s all-out total of 199. She occupied the crease for the entire innings, as she was last player out. She faced 106 deliveries, of which seven were dispatched to the boundary. It was Heather’s first century for Berkshire this summer, having made an uncharacteristic few low scores earlier in the season. Second highest scorer was Alex Rogers with 24 – she and Heather put on 49 for the first wicket – while Aussie Corinne Hall contributed 20. In reply, Warwickshire reached 71 for the loss of two wickets, but then Heather brought herself on to bowl her offspin. She trapped Marie Kelly for 23 in her first over and then had Georgia Hennessy stumped by Carla Rudd for 48. The visitors reached 112-4, but then lost three wickets without any addition to the total and two more went down on 118. They were all out for 123. Berkshire fared badly in the national T20,losing all four games to Middlesex and Sussex over two days at Wokingham CC With our young players having another year of experience behind them, Berkshire will be looking for more success in 2015. Australian vice-captain Alex Blackwell joins Berkshire for part of the 2015 season, while Corrine Hall returns for a second year, having been joined by Heather at Tasmania Roar during the winter. Heather enjoyed tremendous success Down Under and that, of course, follows up her appointment of vice-captain to Charlotte Edwards in the England Women’s team. Heather has certainly helped to put Berkshire on the map in women’s cricket. Heather Knight will again captain Berkshire and Lissy Macleod will deputise in Heather’s absent when on England duty. Alex Blackwell, Australian vice captain will play for Berkshire 24th May, 25th May, 14th June & 5th July and Corrine Hall, Australian, Tasmania Roar, will play all other matches for Berkshire. 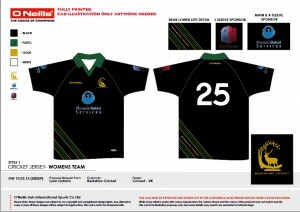 Berkshire will play in Black,Green and Gold. 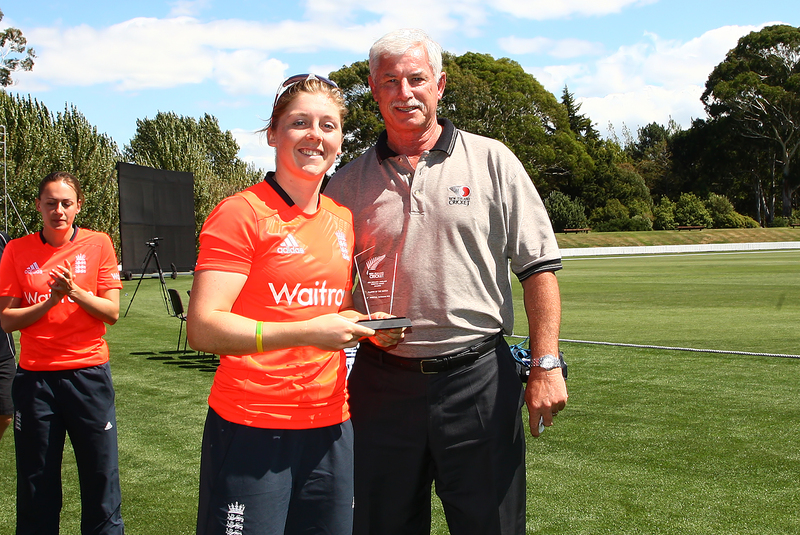 Above photo shows Heather Knight receiving Player of the Match award in New Zealand earlier in the year.